Turns fan ON at 176 degrees and turns fan OFF at 161 degrees. A/C Request option turns on the fan when the A/C compressor is engaged. This proven, stand alone unit supplies the absolute best protection for your vehicle when using an electric cooling fan. Package includes a 30 amp fuse (mounted on relay bracket) and a high quality relay to carry the high amperage. This provides full battery voltage with top quality wiring. 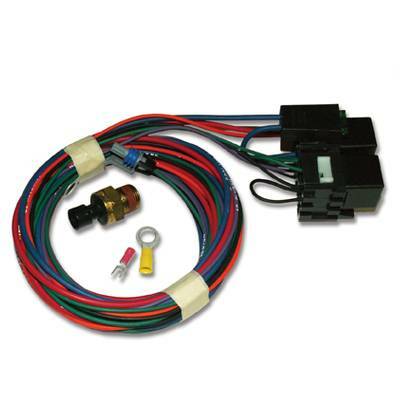 This also eliminates the heavy load on the vehicle's ignition switch. This unit has a highly reliable thermostat. Sensor has a 3/8" pipe thread. Note: Replacement sensor is part number AR-33.